I've learned from watching TRL and the Tiger Woods scandal coverage that the bigger the wheel, the classier and more powerful the car and owner these days. But in 1977 it didn't matter if you had 13" wheels - so long as there were six. 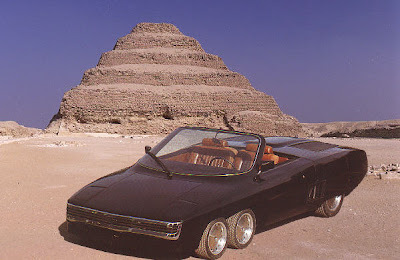 Panther Motor Company, the English car company who became famous for making the DeVille and later the Solo, decided that the completely roofless, Tyrell-esque, turbo 8.2L Caddy powered, digi-dash-future-barge segment was largely untapped. After the second Panther 6 was built, the market was completely saturated and production ceased. Enough description, just watch this 70's promo video and imagine what life would be like if you had one.